German brand based in Hennef. Provides sustainable, high performance, user-friendly quality products. A professional football club, playing in the German Bundesliga. To be at the top of your game you need a strong foundation to build on, a skilled and motivated team and then its practice, practice, practice. German Bundesliga team 1. FC Köln is ahead of the game when it comes to caring for their training ground; especially the grass pitches. Subjected to heavy use from daily training and matches it is a big job to ensure pitches are kept in top condition all year round. 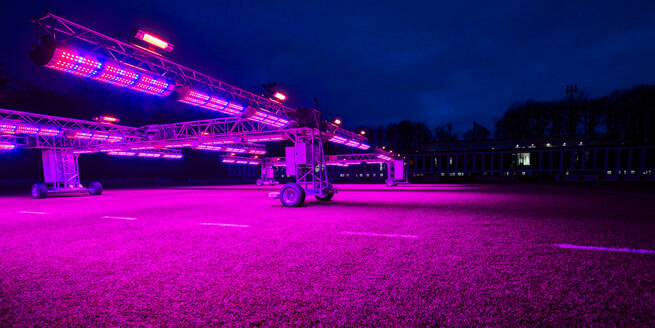 Research by the Greenhouse Laboratory Centre at the Weihenstephan Research Centre at Munich University concluded that modern LED technology is suitable for replacing the sodium-vapor lamps currently used as grow-lighting. Based on the research, 1. FC Köln decided to invest in a modern, innovative lighting system that would help keep their grass pitches in perfect condition. RHENAC GreenTec AG developed and manufactured a special pitch-lighting system fitted with highly efficient LEDs and optics. The mobile system can be moved easily to any area of the pitch requiring treatment and has a special light spectrum, together with an integrated infrared heating system, to provide ideal grass growing conditions night and day. LEDiL’s TINA2 optics help direct LED light efficiently on the targeted area resulting in high photosynthetic flux density – meaning more photons hit the grass and speed up growth. Compared to the old sodium-vapor lamps, LED technology not only reduced energy consumption, but also provided up to 6 times more light compared to normal light intensity. Gaps in the grass can now easily be repaired and the highly stressed goalkeeper area is now covered in strong, rich green grass. “We are saving significant amounts of energy with the new lamps that not only goes easy on our budget, but in the long run, also on the environment,” explains Alexander Schmidt, Head of Controlling and Organisation at 1. FC Köln. The optimal light spectrum and flexibility the mobile system provides ensures 1. FC Köln’s pitch at the Franz-Kremer Stadium and their training ground in the RheinEnergieSportpark Stadium, are in peak condition throughout the year.